The reason for this delay in adopting the sport, aside from the usual Yorkshire resistance to modern trends,FN2 was most likely that until this time these towns had been dominated by their respective rugby league sides. The game of rugby had spawned from the same roots as ‘Association’ football – the catching, running and kicking sports first played at English public schools. Former students of these schools took the games back to the provinces and so further variations developed in isolated pockets before spreading nationwide. Soccer evolved in the Midlands, Lancashire and London, while most of Yorkshire happened, somewhat ironically, to favour the game started at Rugby School, Warwickshire. This split ultimately saved many of Yorkshire’s rugby teams, but it meant they were no longer involved in a prestigious nationwide competition or indeed guaranteed to survive. This created a vacuum into which Yorkshire’s new football clubs could grow. York’s rugby team, York Wasps, initially resisted switching to the Northern Union, only joining in 1898, arguably missing the boat somewhat. However, all this only partly explains why it took so long for the city to spawn a football club. York in particular had plenty of alternatives to offer the budding sports fan besides its rugby team. 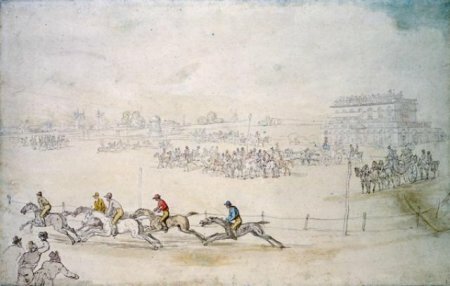 Its famous racecourse had been attracting visitors since 1731, while the River Ouse lent itself to rowing and sailing. York Cricket Club (not to be confused with Yorkshire CCC) was founded around 1784 and the city also had a theatre, opera house and – of course – many, many pubs to keep citizens entertained. No wonder the football club seems like an afterthought in York’s long history. Indeed, the first incarnation of York City struggled, lasting only two seasons in the Northern Football League before joining the Yorkshire Combination to reduce travel costs. They turned professional in 1912 and successfully entered the Midland Football League, but went bust during the First World War. The club reformed in May 1922 with a new ground at Fulfordgate, a ‘splendidly drained, well equipped, spacious’ stadium with a potential 40,000 capacity,FN4 according to their (unsuccessful) application to the Football League in 1927. However, Fulfordgate’s out-of-town location proved impractical, so City moved to the more central location of the cricket club’s old ground, Bootham Crescent, in 1932. The club initially played in maroon and white stripes, then all maroon. In an apparent attempt to cash in on one of York’s other distractions from football, it’s chocolate-making industry, they also played in a cocoa-brown strip for five years, before reverting to red. 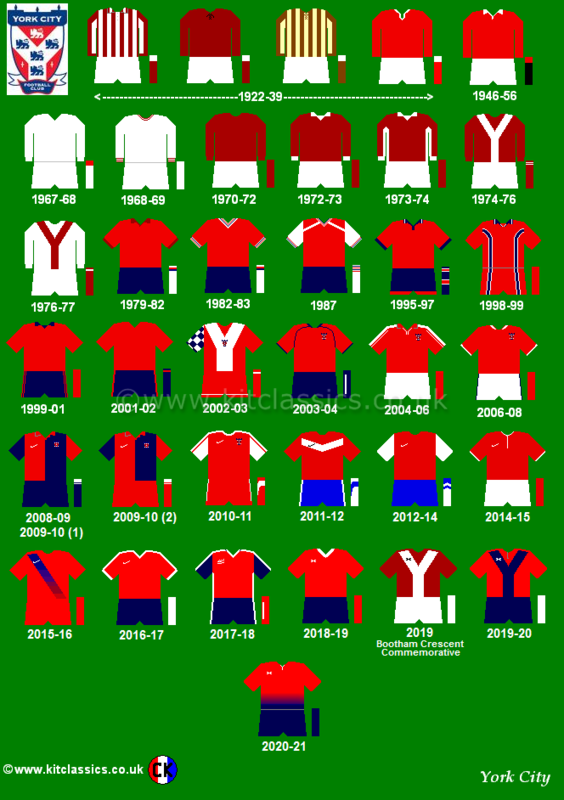 The club would continue to wear red (and usually blue shorts) into the modern age except for brief experiments with white shirts in the ’60s and ’70s. Some of these kits also included a unique ‘Y’ design on the front, similar to the motif in the club’s current crest. York City eventually entered the Football League Third Division (North)  in 1929 and would remain at that level for nearly three decades. Twice they narrowly avoided finishing in the bottom two places (meaning they would have to re-apply for their League status) with wins at the tail-end of the season. Re-application was necessary after they propped up the Football League in 1949/50 and an erratic period between 1953 and 1955 saw a league position sequence of fourth (a new club record high), 22nd and then fourth again. In that latter season they also had their best ever run in the FA Cup, reaching the semi-finals and losing to eventual winners Newcastle United in a Roker Park replay. In the summer of 1958 York were effectively relegated (unluckily having finished 13th of 24 teams) as the North and South Divisions  were reorganised into Third  and Fourth , but won their first ever League promotion the following season as runners-up. Several relegations, promotions and a couple more League re-applications occurred during the 1960s and ’70s until they finally reached the Second Division  in 1973 by dint of finishing third – if 1958 was bad luck, it was repaid here as promotion for the top three had only just been introduced. Second-tier status only lasted two seasons before a dramatic three-year slide saw them end up third from bottom of the Fourth Division  in 1977/78 and having to re-apply for League status for the sixth time. Presumably the club had got pretty good at those re-application letters by now, which was lucky because they had to write another one in 1981. The 1983/84 campaign saw York City win their first competitive trophy as they topped the Fourth Division with 101 points, the first time an English team had achieved a three-figure tally,FN5 three years after the Football League introduced three points for a win, though they would still have comfortably beaten their nearest rivals under the old system. Their manager at the time was Denis Smith, the fearless former Stoke defender who once got in the Guinness Book of Records for the amount of injuries he had. The following season Smith guided his team to a famous victory over Arsenal in the FA Cup. This giant-killing was only surpassed a decade later when York beat a Manchester United side – including the likes of Ryan Giggs, David Beckham, Gary Pallister and Denis Irwin – by three goals to nil at Old Trafford in a League Cup away leg. Manager Alan Little’s side then managed to hold out for a 3-1 defeat in the return leg, which meant they won the tie on aggregate and denied United the chance of adding the League Cup to the Premier League  and FA Cup they would go onto win that season (1995/96). Little had already guided York to what would be their last spell in Division Two  with a play-off victory over Crewe Alexandra in 1993. York were relegated (and Alan Little sacked) in the 1998/99 season and by 2004 they had finally dropped out of the Football League after 75 years of close shaves. This time there was no re-application process to save them. Ownership of the club changed hands several times during this period, including a brief but disastrous period under former racing driver John Batchelor who later admitted to asset-stripping the club to the tune of £300,000, having paid £1 to take them off the hands of previous owner Douglas Craig. Batchelor was a bizarre character who had changed his name several times – to John Top-Gear and later John B&Q – to win sponsorship deals for his racing teams. He applied this technique to York City too, changing the ‘Football Club’ in their name to ‘Soccer Club’ in a naïve attempt to appeal to the US market.FN6 It didn’t work. Nor did putting a chequered flag on the club’s crest to tie in with his York City Racing touring car team. After all the competition from other sports York City had faced, who would have thought it was motor racing that would come closest to killing the club? York City Supporters’ Trust eventually wrested back control of the club,FN7 but not soon enough to preserve their Football League status. John Batchelor died in 2010 from issues relating to alcoholism. He was not mourned by the people of York. Their hangover from his 11-month reign lasted until 2012 when City not only secured promotion back into the Football League but also won the FA Trophy with a 2-0 win over Newport County at Wembley. Most recently they were relegated again in the 2015/16 season, finishing bottom of League Two . They now share Bootham Crescent with a second-tier rugby league side called York City Knights,FN8 proving after more than a century that York is big enough for both rugby and soccer. Just about. FN1Bradford City, 1903; Hull City, 1904; Leeds City, 1904; Huddersfield Town, 1908. FN2I’m half-Yorkshire myself, so I’m allowed to say this. FN3The Rugby League as we know it was initially called the Northern Rugby Football Union, changing its name to the Northern Rugby Football League in 1922. The ‘Northern’ was not dropped until the 1980s. FN4Despite this claim, Fulfordgate’s record attendance was 12,583. The actual capacity has been estimated at 17,000, which is still quite impressive for the era. FN5Only nine other clubs have managed it since. The record is Reading’s 106 points in the 2005/06 Championship  season. FN6In 2008 he was trying desperately to buy another club, putting in bids for both Mansfield Town and Accrington Stanley. The former he wanted to rename ‘Harchester United’ after the fictional team in Sky’s Dream Team soap and the latter he planned to relocate to Leigh as ‘Lancashire United’. He had also run for Parliament in the 1997 and 2001 general elections, presumably with a plan to rebrand Great Britain somehow. In 2010 he was disqualified from acting as a company director, but apparently would have passed the Football League’s ‘fit and proper persons’ test. FN7YCST sold a majority shareholding to local businessman Jason McGill in 2007 but retains a 25% stake. FN8Founded after York Wasps folded in 2002.